Behind a chain-link fence topped with razor wire, inmates tend a large plant nursery and vegetable garden. The large expanse dotted with black nursery pots and plants of various sizes grows right outside of the Howard County Department of Corrections. The beds of vegetables will become part of jail meals or given to a local food pantry. It is a place for respite, sunshine and fresh air, where minimum security inmates can help the communities they will return to someday, by potting, watering and weeding plants. The native plants growing are destined to become part of Howard County’s stormwater control program. 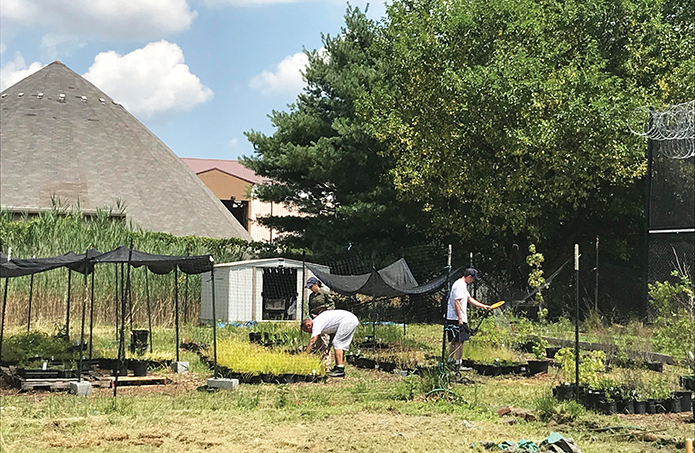 Young residents, ages 16 to 25, turn the nursery stock into rain gardens, swales and native plant landscapes as part of a summer employment program that teaches them the basics of green infrastructure installations. Workforce development and restorative justice programs help busy public works departments or stormwater managers get their work done while teaching participants valuable work skills. As communities strive to create more green spaces while reducing polluted stormwater by installing green infrastructure, the need for trained employees will grow. Natural landscaping or green infrastructure includes such practices as rain gardens and swales, which mimic nature by using plants and trees to filter, retain and absorb water instead of allowing it to flow quickly from surfaces into water bodies. Like other stormwater control devices, green infrastructure can also require labor-intensive maintenance. Rain gardens get filled with cigarette butts and trash, while street trees need trimming. Often, these are the tasks that go undone. With time– and cash-strapped local governments required to do more with less, nontraditional sources such as corrections agencies and high school students seeking employment can help fill those gaps while learning valuable work skills, said Mary Gattis, coordinator for the Chesapeake Bay Program Local Government Advisory Committee (LGAC). Howard County isn’t alone. Other local governments have started their own programs, and the LGAC recently called on all of the states in the region to support similar training programs to provide job skills and help address a looming workforce shortage when it comes to installing and maintaining the large amounts of new green infrastructure that will be needed to meet Bay cleanup goals. It was a desire to solve two problems in Howard County that led to the launch of its Restoring the Environment and Developing Youth (READY) program in 2012: the need to ramp up stormwater control and the abysmal state of youth employment. A group of church congregations came up with the idea of combining solutions. Their idea went to the Howard County government which decided to fund READY. It has been the providing those services over the last six years. The organization evolved into EcoWorks which branched out to include work with people incarcerated for low-level crimes and provide a more diverse list of services with the same mission. Their ultimate goal is to empower people who are not traditionally represented in environmental circles to respect and restore natural systems for future generations. A similar program recently started in Baltimore. And Montgomery County has been providing “restorative justice” programs in their corrections centers for about 25 years. Robert Green, director of the Montgomery County Department of Corrections and Rehabilitation, said the county work crew has a long waiting list of local governments requesting one of his work crews. The program teaches inmates important work skills, Green said, but just as important as planting street trees and removing trash is how participants feel about themselves and their communities. Restorative justice programs, at their core, are aimed at serving the community and individuals that suffered from the crimes. It’s not about punishment, but forming a connection to community that inmates may have never felt, Green said. The crews are made up of low-level offenders who avoid going to jail by participating in either a drug intervention or alternative community service program. They maintain trees and plants at county offices, clean graffiti where it’s an eyesore and paint parking spots where electric cars can plug in. Inmates benefit by learning real job skills and connecting with their communities. And if they successfully complete the program, their records may be expunged. But don’t picture inmates on the highway with their orange jumpsuits picking up trash. They do pick up trash, lots of it — about 25,000 garbage bags over two years in Montgomery County — but they wear civilian clothes. 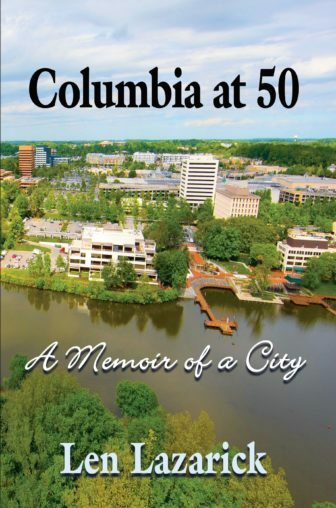 Cleaning shorelines, removing trash from sidewalks and waterways and clearing stormwater drains is just some of the work they’ve performed for the city of Rockville, 21 county libraries, bus stops and other sites. Their slogan is keeping communities clean and green. A very important part of the program is helping inmates gain a sense of self, Green said. Green said that needed next steps include helping to connect inmates with job opportunities in farming and environmental work when they complete their sentence. He said 92% of inmates go back to their own communities, but many are barred from work opportunities because of their criminal records. In Howard County, EcoWorks applied for a grant to provide a landing spot for released inmates who need a job. Lilly has commitments from six employers who specialize in green infrastructure, ecosystem restoration or landscaping to hire the graduates of the program. But first, they would spend six weeks working with EcoWorks. So far, EcoWorks has put 31 inmates through classroom and hands-on sustainable landscaping training. Most received a certificate for their efforts. While inmates are in the classroom or garden, the corrections agency saves money as the nonprofit is taking care of their needs, Lilly said. She estimates that Howard County saved $47,748 in costs over the three years she’s been running the program. In addition, she said, there are free mental health benefits to the participants from exercise and being outdoors surrounded by green, growing plants. This fall, Lilly should find out if its next step in developing the program will be funded.